Evaluation for causative disorders should be done based on clinical symptoms. A mainstream physician wont do much if any testing once they’ve determined their patient has male-pattern and female-pattern hair loss. Many readily available blood, urine and saliva tests could be done to understand metabolic, hormonal and nutritional issues in the body. Other articles will discuss these further. 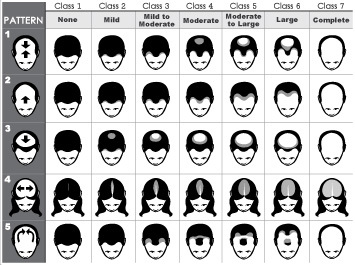 The pull test: to evaluate diffuse scalp hair loss. Gentle traction is exerted on a group of hair (about 40–60) on three different areas of the scalp. The number of extracted hairs is counted and examined under a microscope. Normally, <3 hairs per area should come out with each pull. If >10 hairs are obtained, the pull test is considered positive. 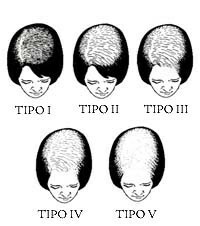 The pluck test: In this test, the individual pulls hair out “by the roots.” The root of the plucked hair is examined under a microscope to determine the phase of growth and used to diagnose a defect of telogen, anagen, or systemic disease. Telogen hairs are hairs that have tiny bulbs without sheaths at their roots. Telogen effluvium shows an increased percentage of hairs upon examination. Anagen hairs are hairs that have sheaths attached to their roots. Anagen effluvium shows a decrease in telogen-phase hairs and an increased number of broken hairs. Hair mineral analysis: Tests for minerals and heavy metals. Scalp biopsy: This test is done when alopecia is present, but the diagnosis is unsure. The biopsy allows for differing between scarring and nonscarring forms. 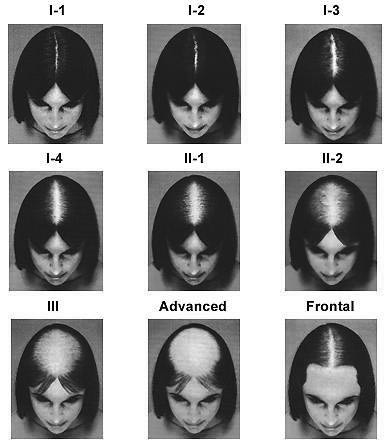 Hair samples are taken from areas of inflammation, usually around the border of the bald patch. Daily Hair Counts: This is normally done when the pull test is negative. It is done by counting the number of hairs lost. The hair that should be counted are the hairs from the first morning combing or during washing. The hair is collected in a clear plastic bag for 14 days. The strands are recorded. If the hair count is >100/day is considered abnormal except after shampooing, where hair counts will be up 250 and be normal.